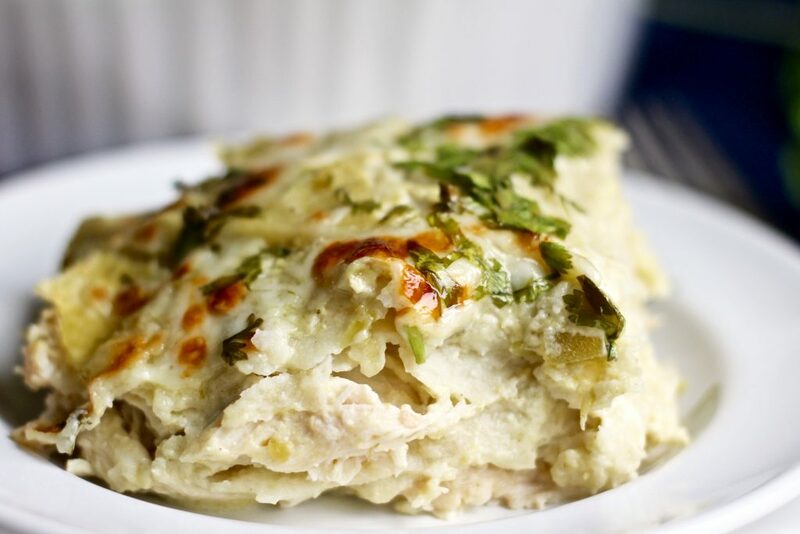 This shortcut creamy chicken enchilada bake is the perfect recipe to satisfy all your Mexican food cravings! 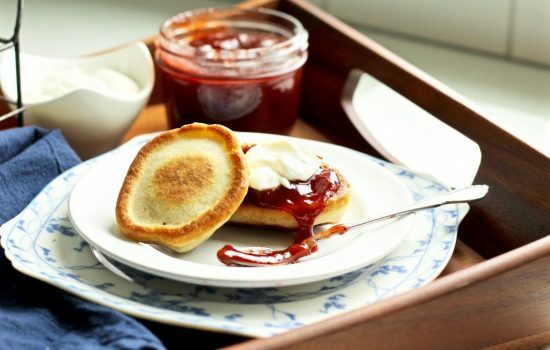 Normally when a recipe offers a “shortcut” it can sacrifice on flavor and quality. But in this case, the rotisserie chicken improves it significantly. 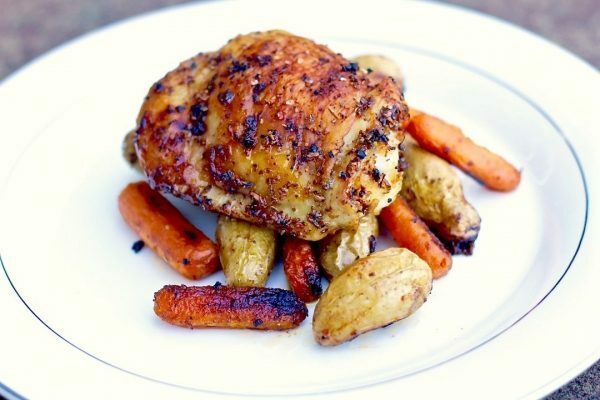 There’s nothing that will give you as tender and juicy of a chicken breast as rotisserie chicken! 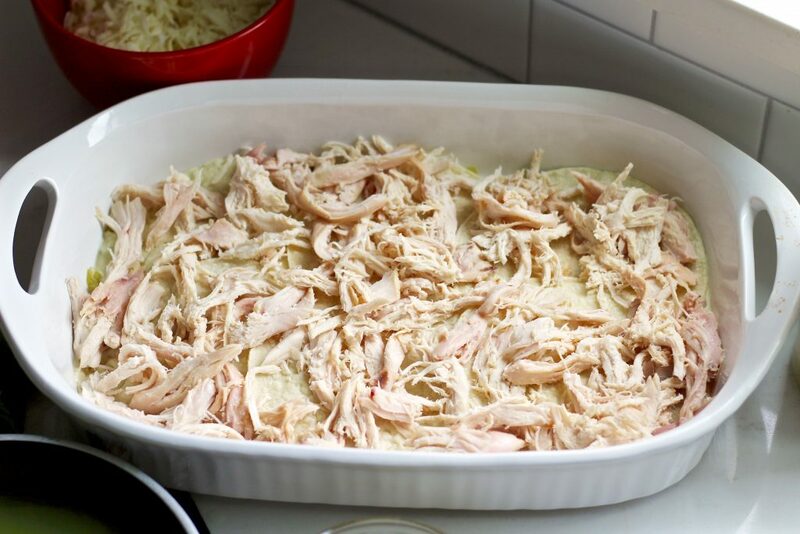 With flavorful, juicy rotisserie chickens going for just $5 at Costco, I can’t resist using them in my recipes! 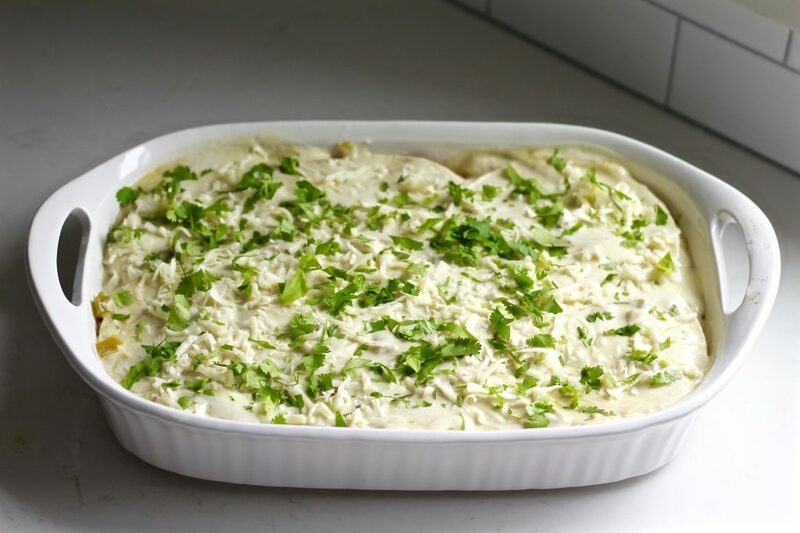 The other thing that makes this shortcut creamy chicken enchilada bake super easy (and saves so much time!) is that you don’t have to roll up individual enchiladas. 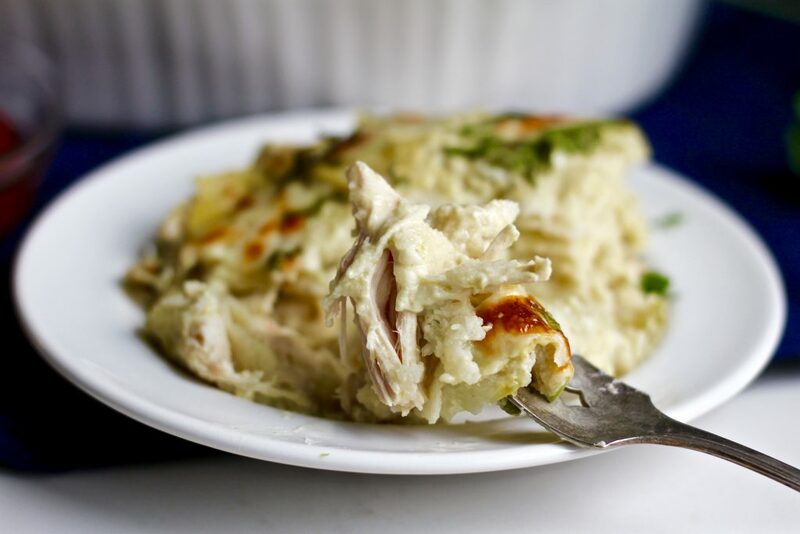 The ingredients are layered (kind of like a lasagna) making prep time quick and simple. 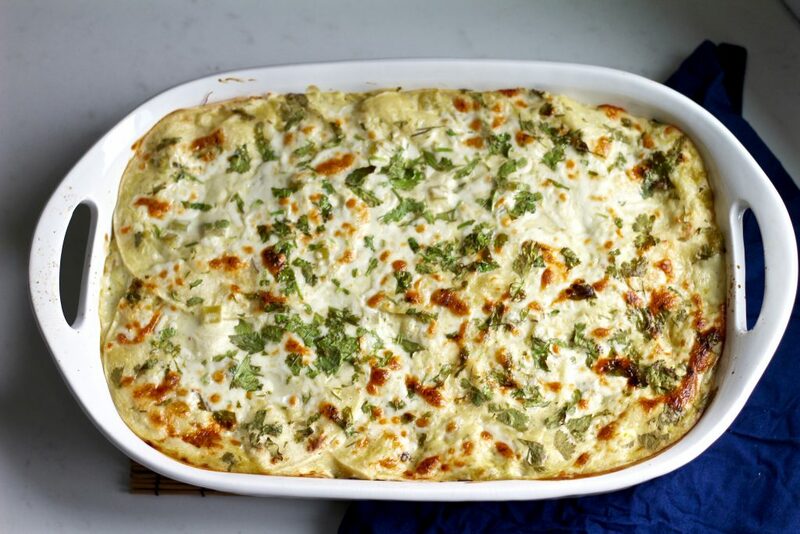 In the end you get a dish that is creamy, cheesy, flavorful, and takes minimal time to make! 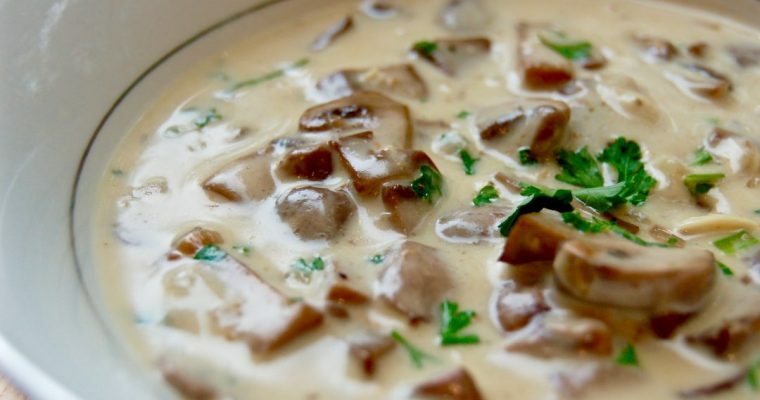 In a small pan, bring one cup of chicken broth to a simmer. 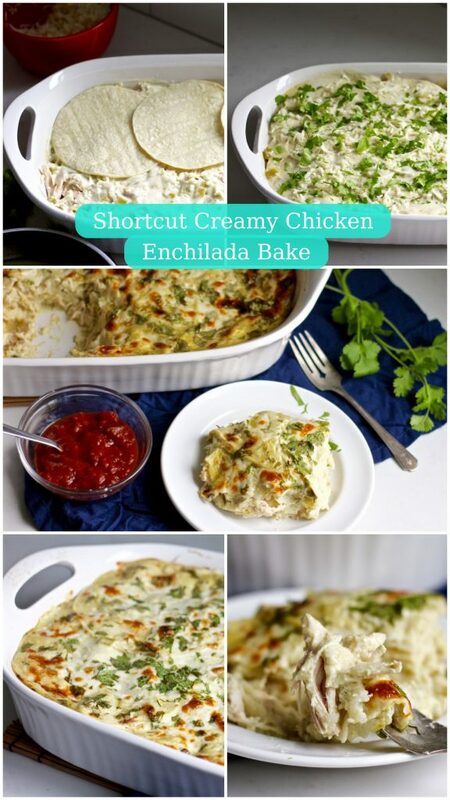 Begin by mixing together enchilada sauce and sour cream in a small bowl or glass pitcher. 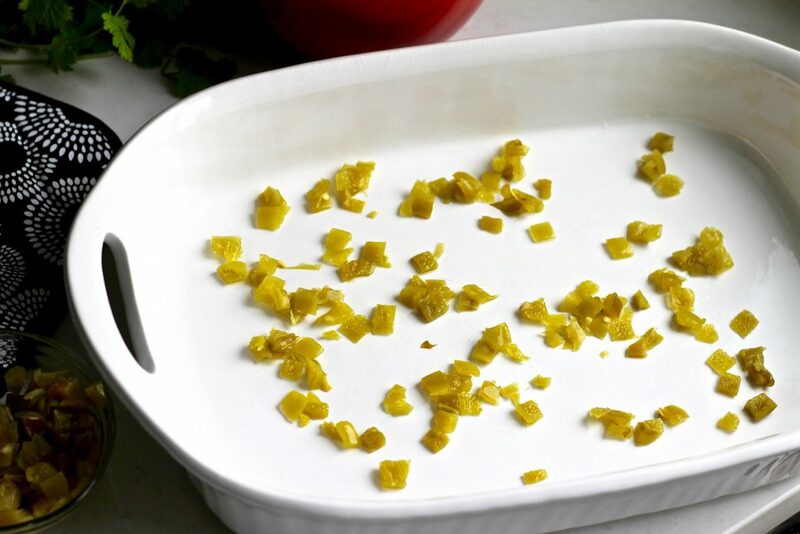 Then, sprinkle about 1/4 of the diced chillies on the bottom of a 9×13 baking (casserole) dish. 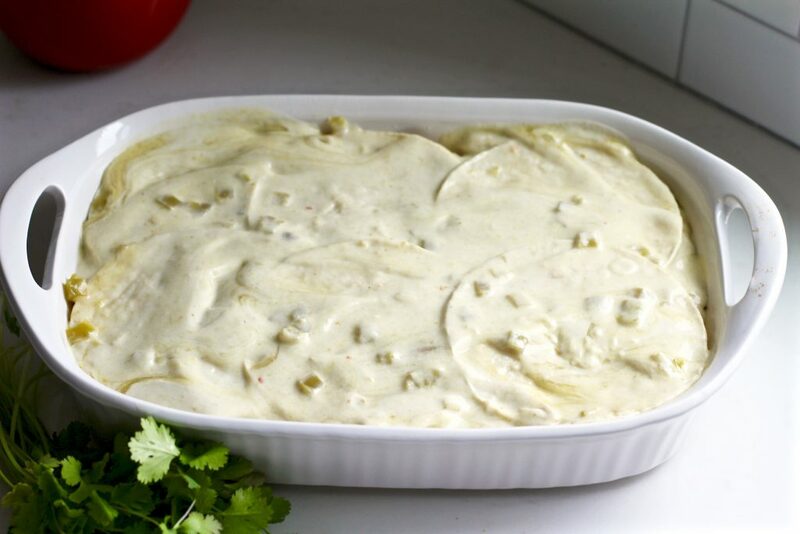 Spoon some sour cream and enchilada sauce to create a thin layer on the bottom of the dish. Sprinkle half of the chicken on top of the tortillas. Pour 1/3 of the remaining sour cream and enchilada sauce mixture on top. Sprinkle some diced chillies and 1/3 of the shredded cheese on top of the sauce. You’ve created your first layer! Next, dip another six tortillas into chicken broth and layer evenly on top of the chicken and cheese. 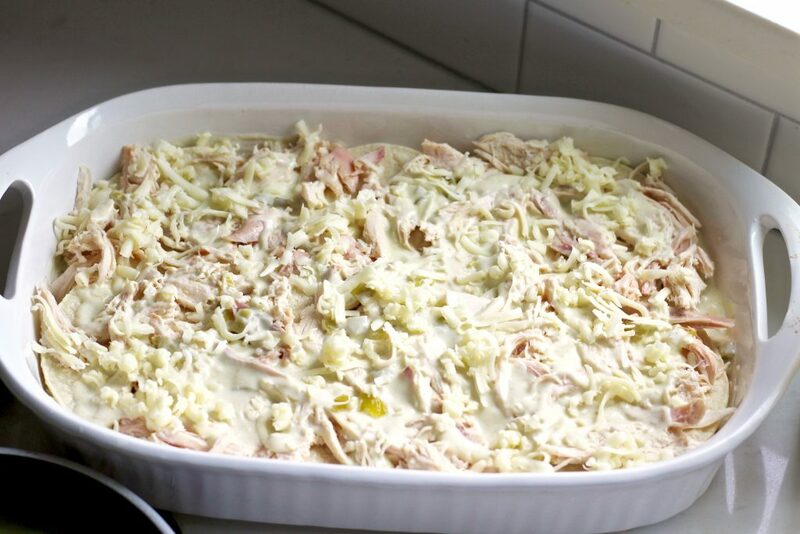 Spread remaining chicken on top and another 1/3 of the sauce, cheese, and chillies. 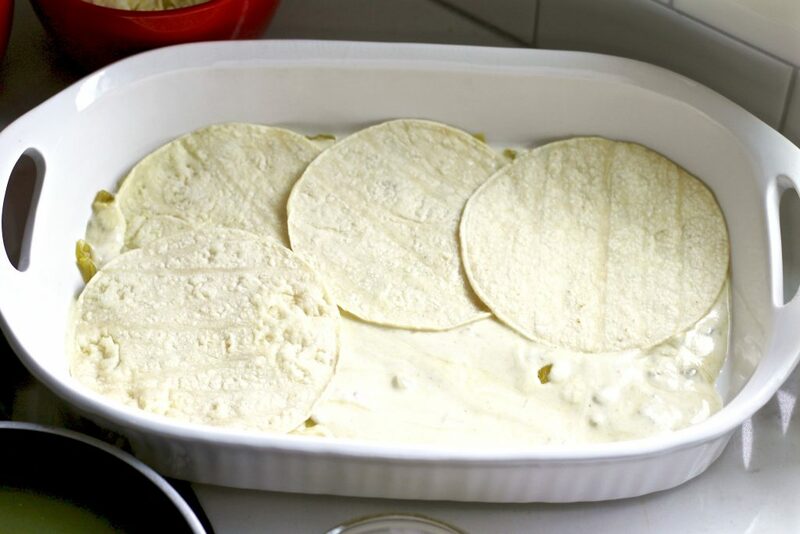 Next, dip the last six corn tortillas into the chicken broth and lay them down to create the final, top layer. Finally, cover with remaining chillies, sauce mixture, and cheese. Sprinkle chopped cilantro on top. 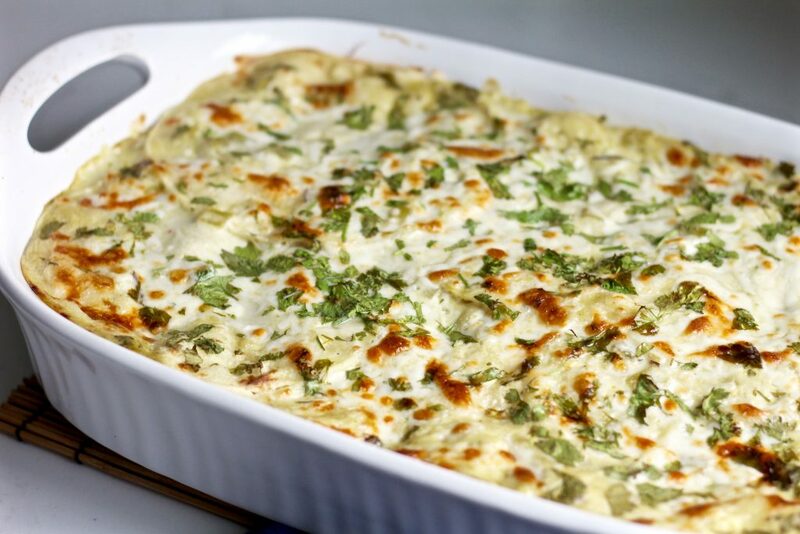 Cover with foil and bake at 375 degrees for 25-30 minutes until warmed through and cheese is bubbly. Remove foil and broil on high for 2-3 minutes to get some color on the cheese. Wait at least 15 minutes to slice and serve with additional cilantro if desired. I love how tender and flavorful the corn tortillas are, the whole dish just kind of melts together in the oven. And nothing beats the flavor of rotisserie chicken! 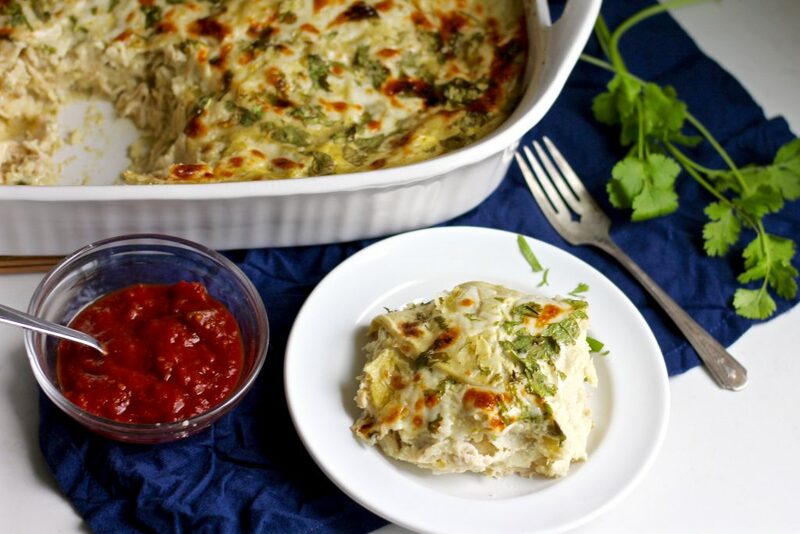 Serve this shortcut creamy chicken enchilada bake with our fresh salsa on the side for an extra kick of flavor! 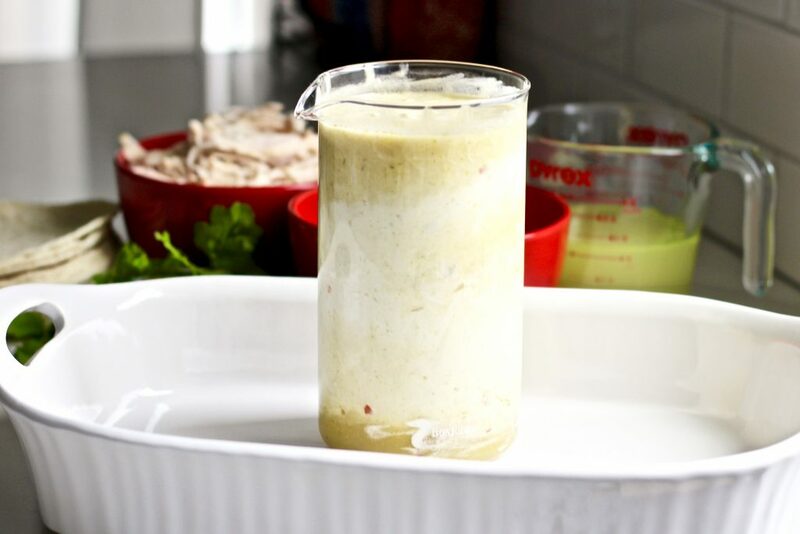 Mix together enchilada sauce and sour cream in a small bowl or glass pitcher. Sprinkle about 1/4 of the diced chillies on the bottom of a 9x13 baking (casserole) dish. 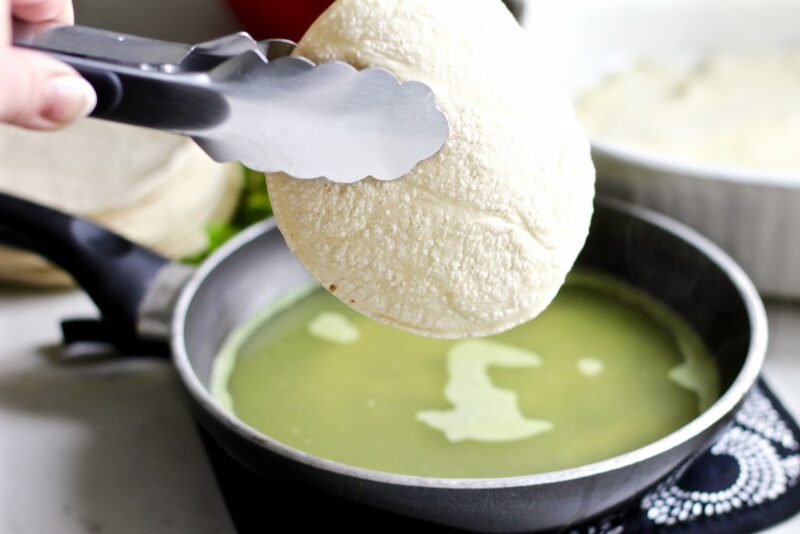 Using tongs, dip one corn tortilla into the simmering broth for a few seconds and arrange in the baking dish until you have used six tortillas to create the first layer. Sprinkle some diced chillies and 1/3 of the shredded cheese on top of the sauce. 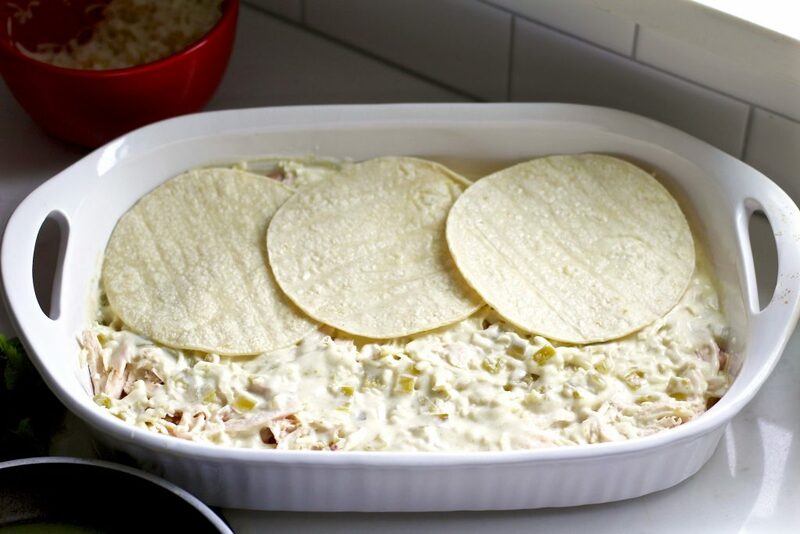 Dip another six tortillas into chicken broth and layer evenly on top of the chicken and cheese. 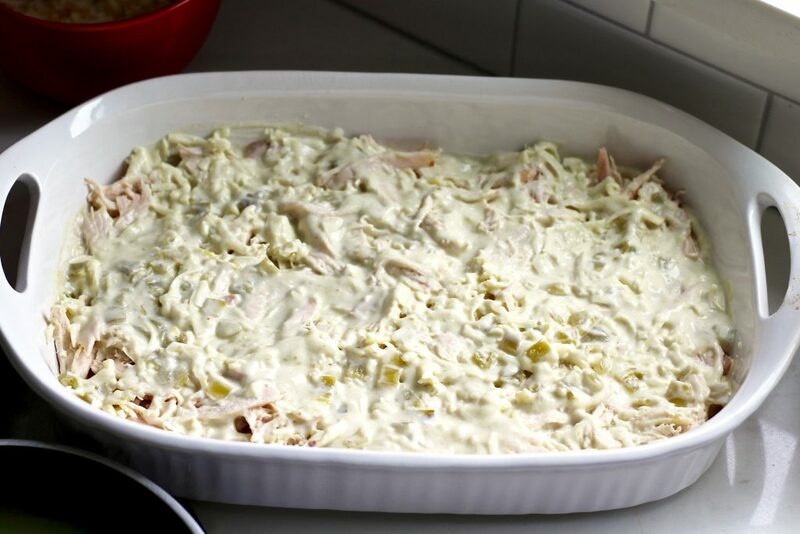 Spread remaining chicken on top and another third of the sauce, cheese, and chillies. 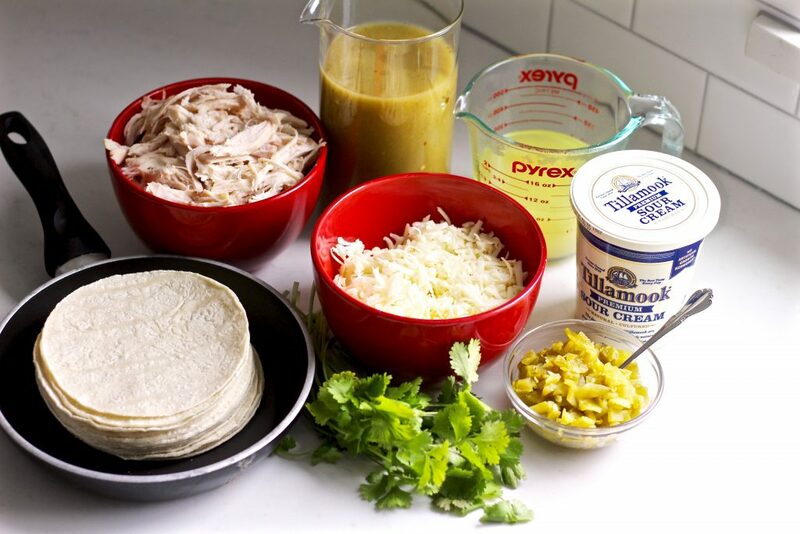 Dip the last six corn tortillas into the chicken broth and lay them down to create the final layer. 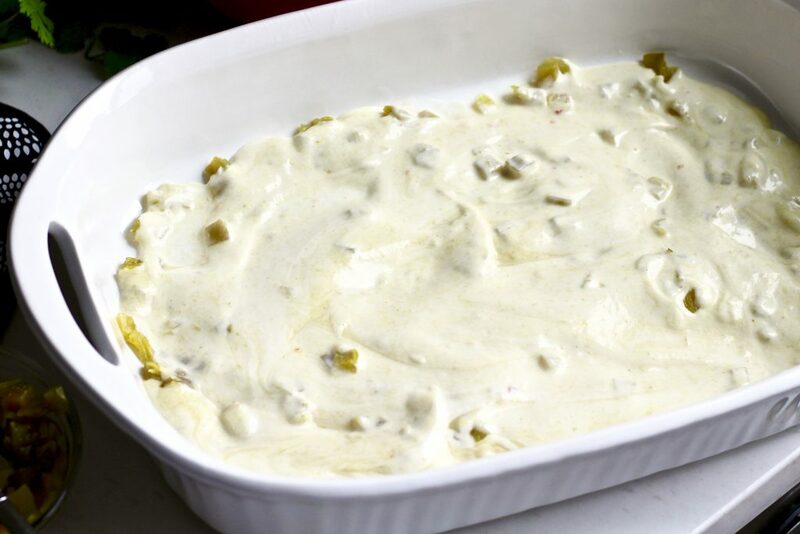 Cover with remaining chillies, sauce mixture, and cheese.